In Incident, you can save frequently used searches and reports to run quickly and easily again in the future. Saved Actions can also be scheduled to run on a recurring basis and automatically email you the results. View the Advanced Search and Report pages for details on how to save them for use as Saved Actions. Click on the List link in the Actions menu located under the Search For box, then click the Saved Actions link from the box. You will see a list of all the Saved Actions in your Incident account. Find the one you want to run and click on the Title. *Note: All public saved reports and searches made by any user in your organization will show in this list. You can filter the list for just the ones you have created by selecting your name in the Created By filter drop down at the top right of the list. If you clicked on a saved Advanced Search, this will take you to the Advanced Search screen with the saved search criteria already selected. Scroll to the bottom of the page and click Search Now. If you clicked on a saved Report, this will take you to that Report screen with the saved report criteria already selected. Scroll to the bottom of the page and click Print. You can also access your saved searches and reports directly from the Advanced Search and Reporting screens. This will filter the saved actions to only show the ones that pertain to that type of report or search. For example, if you are on the Incident Report screen, you will see only the saved incidents reports listed in the drop down. Click on the drop down box labeled Saved Searches or Saved Report and select the one you want to run. The screen will refresh and display the saved search/report criteria. Scroll down to the bottom of the page and click the Search Now button for an Advanced Search or the Print icon for a Report. Your results will appear on the next screen. You will see a list of all the Saved Actions in your Incident account. Find the one you want to schedule and click on the word New under the Schedule column. The next page gives you options for setting up the recurrence pattern for this saved action. 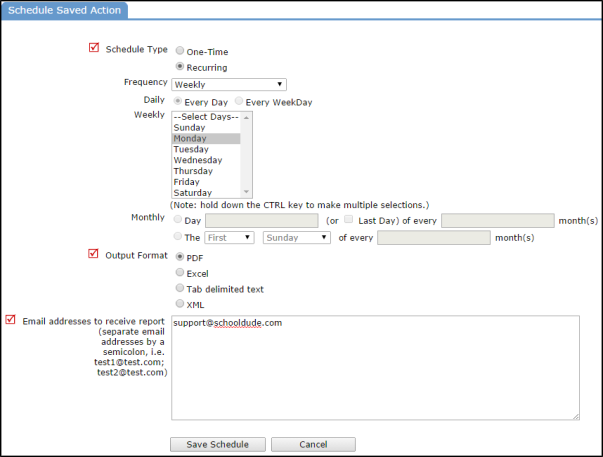 Select Recurring as the Schedule Type. In the Frequency drop down box, choose whether you want to receive these search results Daily, Weekly, or Monthly. For Daily, you can choose Every Day or Every Weekday. For Weekly, select which day(s) of the week you want to receive these search results. Select the Output Format for your results. The most common choices are PDF and Excel. Enter the Email Address(es) that these search results need to be sent to each time. To enter multiple email addresses, separate them with a semicolon. *Note: The email addresses do not have to belong to registered Incident Users. You can send these search results to anyone you choose. To remove a saved search from the drop down on the Advanced Search page or a saved report from the drop down on the reporting page, you will need to navigate to your Saved Actions list. Click List in the Actions bar, and select Saved Actions in the pop-up window. Click the thumbs up icon ( ) to deactivate the saved search or report. This will remove the item from the drop down, but keep the search or report saved in your saved actions list for future use. *Note: If the saved search or saved report is set up to email on a recurrence pattern, emails will continue as normal. If you would like to delete the saved search or report entirely, click the red x icon ( ) for it. *Note: If the saved search or saved report is set up to email on a recurrence pattern, this will stop the saved search or report from being emailed on a recurring basis. The saved search or report will no longer appear in the drop down.